The question “how to hang a whiteboard” is not among the rarely asked ones. Now it’s quite difficult to imagine an office without a whiteboard. Many offices and companies hold regular seminars and presentations, so the board is simply an indispensable assistant in their arsenal. This is not only a suitable surface for drawing diagrams and graphs but also a convenient object for fixing various visual materials with a magnet. The whiteboard can be used also in your everyday life at home. They are popular among office workers, teachers of educational institutions, and also can become the irreplaceable assistant in your regular doings. Before the whiteboard installation, lay it down at room temperature in a horizontal position at a flat surface for at least 8 hours. The deformation of the plane of the board is allowed (after installation, it will straighten after some time). Make sure that the list of complication is available and corresponding. All the items must be present. It is not recommended to install the whiteboard near heat sources and in places exposed to direct sunlight. Prepare a place around the installation point. Remove the board and its accessories from the package. Remove carefully to avoid the damage. Mark the bottom and side borders of the board on the wall. Make a mark of the holes location on the bottom border to mount the brackets. Use the building ruler if necessary. Drill the holes in the wall and fix the brackets with screws and dowels, mounting through a round hole of the bracket. 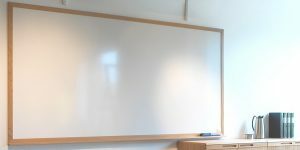 For the large whiteboards it is usually installed an additional bracket in the middle of the board. Install the board on the bottom brackets and mark the upper limit for further installation. Don’t forget to hold the board while marking the upper border to avoid markup errors. Mark the the location of the holes on the upper border to mount the brackets. Drill the holes in the wall and fix the brackets with screws and dowels. Mount the board through the oval hole of the bracket, don’t fully tighten the screw. After mounting, the bracket should move with force within the oval hole. For the large boards, it is usually installed an additional bracket in the middle of the board. Install the board on the lower brackets, pressing it against the wall, lower the upper brackets, and fix the board to be installed. Ensure the reliability of the construction. Hold the board during installation. Place the shelf on the lower end of the board by pressing until it clicks. Before removing it is recommended to cut the film around the perimeter with a stationery knife. This is how to put a whiteboard on the wall by yourself.